Moving is never easy. When you’re packing up your entire life and shipping it off to somewhere new, you’re bound to hit a snag, no matter how much you plan and prepare. At Schaefer, we know how difficult the process of moving can be (throw in the whole “buying a new home” deal and it can really be a headache!) So we’ve put together some of our best moving tips that we hope will make your next move smooth and steady. We’ll bet you haven’t heard some of these ideas! Get a free, in-person moving quote: Any reputable moving company will be happy to send out a representative to take a look at all of your belongings and give you a realistic quote, especially if you’re moving a long distance. And make sure they mark down EVERYTHING! Don’t forget about rugs, artwork, and any appliances you plan on taking with you. Give yourself extra time: Unless you plan on driving your moving truck yourself, give yourself lots of extra time. Long-distance movers will usually rack up a few jobs before delivering your items, which means even if it only takes one day of driving to get to your destination, plan on it taking much, much longer. Get eco-friendly boxes: Traditional cardboard boxes are a fire hazard and a magnet for mold. Plus, bugs love hanging out in boxes, and no one wants ants moving into their brand new home! Lots of moving companies will rent you plastic moving boxes. Or if you’ve already stocked up on cardboard boxes, unpack them and donate or recycle them ASAP. Take photos of electronics: Snap a few shots of the back of your TV, stereo system, and any other electronics that have a lot of wires BEFORE you pack them up. This way when you get to your new home, you’ll know exactly which cables go where. 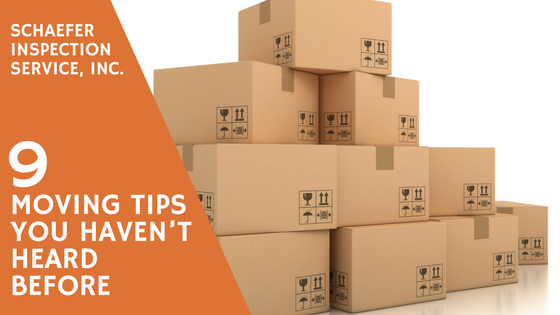 Don’t put boxes on the basement floor: When we move into a new space, sometimes there are a few boxes that we just need to get out of the way. Keep them off the basement floor which could be wet or moldy. Put boxes you’ll get to unpacking later in another room or at the minimum, on a slightly elevated wood pallet. Also keep boxes away from the wall, where humidity can build up, giving mold an opportunity to form. Don’t put boxes in the attic: Cardboard boxes (especially those filled with paper) look really delicious to termites when hanging out in your attic. If you need to store stuff there, transfer your goods to plastic containers to starve those wood destroying insects. Don’t put furniture against the wall: Furniture that is flush with the wall or another piece of furniture has no room to breathe. Any moisture that collects in that tight space won’t evaporate, increasing the possibility for mold to develop. If your furniture is made from wood, you’ll also be attracting termites. Give your furniture some breathing room. Turn on the power: Make sure the power has been turned on and the AC or heat is running (especially in the warmer months!) well before you move in. Otherwise you could be heading into a dark, musty, new home with no electricity. Have a Schaefer inspection: So many of our clients have said that our inspection was an easy part of an otherwise complicated, difficult process of buying a new home (really, we’re not making it up! See for yourself on our Google Reviews page here). Make your next real estate transaction a breeze with an informative, thorough inspection with our experts. Click here to schedule an inspection. If you have any other questions regarding mold or home inspections or would like to schedule an appointment with us, give us a call at 1-800-345-2776. You can also reach out to us on our Facebook page here or tweet us @SchaeferInspect.